This article was pulled from the September 2012 issue of Origins (pp. 5–10) and was also the August monthly service sermon at Mission Headquarters of Hawaii. It has been slightly edited with Rev. Colin Saito’s approval. This sermon was originally a part of Rev. Saito’s lecture, “The Importance of the Service,” presented at the Tenrikyo Hawaii Convention 2011, but was cut out due to time constraints. Rev. Saito had explained to me that this version has been modified many times before being presented for the MHQ of Hawaii’s August sermon and realized the true reason why it was not part of his lecture in the Convention. Read on to find out. Good afternoon and thank you for your joyful participation in Dendocho’s August monthly service for the sake of world salvation. Before I begin, I would like to thank Taeko Nakao for her hard work of doing today’s translation into Japanese. Upon the creation of us human beings, God the Parent gave each of us a very precious gift… the gift of the human soul. And along with that, God also gave us another gift, the gift of free will and the freedom to think and create. God also gave to us children another wonderful gift… the concept of relativity, which is experienced through our relationships that enable us to relate to and interact with each other, so that we may gain precious experience to understand ourselves better as we live our lives on this beautiful earth. By ourselves alone, our learning experiences would be very limited. Through our Beloved Oyasama, God the Parent taught us about negative thought patterns or ‘dusts of the mind’ that are detrimental to our attainment of the Joyous Life, the goal of human existence. Today, I would like to talk in general about these ‘dusts of the mind’ and how we can sweep away these negative barriers, so that we may open our channels of communication and enable ourselves to receive divine inspiration and messages from God the Parent to enhance our progress towards spiritual maturity. First of all, I would like to review the Seated Service Part One as explained through the Hawaiian self-healing technique called Ho’o Pono Pono, which I had intended to present at the Hawaii Convention last year (THC Lecture.v5) but was forced to delete it due to time constraints. The Hawaiians believed in many ‘Gods’ such as Lono and Pele the Goddess of Fire and other Aumakua that took many forms such as a shark, a turtle, a rock, or a tree. They also believed that human beings were not separated from nature, but rather, were an integral part of nature. 4) Thank you, and express our gratitude to God for removing those negative memories. The four steps are: I love you, I am sorry, please forgive me, and thank you. Thus, by taking FULL RESPONSIBILITY and making a CHANGE IN YOURSELF, that change that you made would then have an effect on the so-called problem and your action would go on to reverberate outwards like a “ripple effect” and cause a change in the rest of the world as well. That, truly, is taking FULL RESPONSIBILITY! Not just for yourself, but take full responsibility for all our brothers and sisters in the world! This four-step process of Ho’o Pono Pono is very similar to Part One of our Seated Service. In Part One, when you sing “ashiki o harōte” or “all ills sweep away” what is your mind usually focused on? For myself as well as many others, I suspect that we are usually focused on “ashiki” or “dust”… isn’t that so? Part One begins with the “Hands in Prayer” gesture, which is used 40 times in the Mikagura-uta, 202 times if you include the beginning of each stanza and the calling of God’s name at the end, to represent words such as God (16), Service (7), Believe (6), Paradise (2), Request (2), Prayer (2), God’s name, God’s home, Go to Pray, and two times for the word ‘ashiki,’ which is translated as “ills” and is the only word that seems to have a negative connotation. But, God has taught, that this ‘ashiki’ is really only a ‘bit of dust’ stuck on (Ofudesaki 1:53), making it sound like a trivial matter and yet this ‘bit of dust’ stuck on is of paramount importance because its removal is the KEY TO OUR SALVATION. Observation tells us that the greater emphasis with the use of this “Hands in Prayer” gesture is for good things and so these two seemingly ‘out of place’ uses of this gesture must also be for a good thing, don’t you think? When we sit down to do the service, we have an INTENTION to purify our minds and participate in world salvation. Therefore, it is the INTENTION to participate in world salvation that precedes the ACTION of putting our hands together in prayer and saying ‘ashiki’. When viewed in this manner, the process of cleansing our minds definitely becomes a good thing and it matches perfectly with the “Hands in Prayer” gesture! The first step of Ho’o Pono Pono is to say ‘I love you’ and return our thoughts to the Origin, the Love of God. In the Seated Service we are doing the “Hands in Prayer” gesture while saying ‘ashiki’ but through this gesture, I think God also wants us to focus on and return back to the Origin, the Love of God the Parent, from which we were created. Thus having been given free will, we then created our own ashiki. I know this is a lot to think of in just 2 beats, but as you sing, it is necessary to be aware of this sequence because it is God, to Whom you are asking to do the sweeping away of your ‘ashiki’. Therefore, in addition to returning to the Origin, the love of God, you must also think ‘I love my ashiki’ because it is the equivalent of saying, “I accept who I am and what I have created.” Thus with this mental affirmation done, of “acceptance of my causation” as opposed to “denial of my causation”, I can now allow the cleansing process to truly begin. The second step of of Ho’o Pono Pono is to take ‘full responsibility, do the self-reflection, and say I am sorry for all the things I did to bring this into my life, please sweep away the negative memories. Although we may not know exactly what mistakes we did, it is still necessary for us to accept full responsibility for our actions! Yes, I did it and I do take responsibility. In the Seated Service, the same process is done: take responsibility, do the self-reflection, and ask God to sweep away the dust of our minds. If our intent lacks sincerity, nothing will amount from our asking God to cleanse our minds. The third step of Ho’o Pono Pono is to ask for forgiveness and in the Seated Service, the sweep away hand gesture is then flipped back over with both hands cupped together in a request to God to please save us. And finally, the fourth step in Ho’o Pono Pono is to say Thank You to God. In the Seated Service, we give thanks by calling the name of God, Tenri-O-no-Mikoto. You may be wondering why I am talking about something that apparently is not from the Tenrikyo teachings. As you can see, there are similarities but my point is that, by learning about the Ho’o Pono Pono method, I was able to recognize and strengthen the meaning behind the “Hands in Prayer” gesture of Part One of the Seated Service. I always wondered why this gesture was used for such a negative word. Prior to this, I basically focused more on the “dusts of the mind,” the ashiki, to be swept away but now, I truly begin to focus first, on the Love of God and the Purpose of the Service before asking for the sweeping to be done. Rather than just taking the words verbatim and going through the motions of the hand gestures, we should truly attempt to ‘dig up the root’ and seek the underlying meanings of the words and gestures when doing the Service! Yes, nine-tenths of God’s teachings have been taught to us children through the many teachings and masters sent to us by God over the long millenniums of time since our Creation. My intention in sharing about the Hawaiian Ho’o Pono Pono healing technique was to show you just one way of how God the Parent has been teaching us through other sources. In Tenrikyo, God the Parent taught about the ‘eight dusts of the mind’ as a guideline to nurture correct usage of the ‘free will’ that God gave to us human beings. Over the millenniums, we human beings have used so much negative thinking that our minds are ingrained with this negative process. Constant usage of negative thinking such as miserliness, covetousness, hatred, self-love, grudge-bearing, anger, greed, and arrogance, has taken us in the opposite direction from attaining the ultimate goal of living the Joyous Life. With the gift of ‘free will,’ it is our duty to make ourselves aware of these negative thought patterns and try our best to not use such thinking. Although it is our duty to become aware of the eight dusts of the mind, after learning of them, I should like to encourage you to focus not on the negative aspect but rather, I would like to urge you to focus on the opposite and positive aspects of these dusts! Because if you focus on the dust itself, there is the danger that you will continue to attract such negativity! The late Rev. 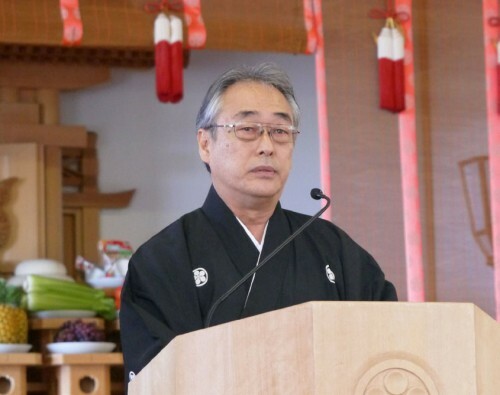 Jiro Morishita (Brotherhood Church) and his wife, Kay (present head minister of Brotherhood Church), created a “Dust Busters” list so that we could focus on nurturing the good characteristics opposite from the dusts of the mind. Instead of putting our focus on the negative aspects we should go directly to what we want to create and practice them daily. Thanks to the late Rev. Jiro Morishita and Kay for this wonderful inspiration. Let us focus on and practice using positive characteristics such as: Generous, Grateful, Loving, Compassionate, Forgiving, Joyous, Considerate, Humble, Honest, and Sincere. In conclusion, upon doing the Seated Service, as you do the “Hands in Prayer” gesture, please be reminded to first of all, bring your mind to the Origin, the Love of God the Parent. Then, with awareness of having been created and given free will, love and accept yourself, take full responsibility, do the self-reflection, and then ask God to sweep clean our heart so you can participate in world salvation. All of these profound meanings should be behind our gestures as we move our hands and sing the words. With the Dust Busters guide, let us practice focusing on positive thoughts and attract only good things into our lives, so that you can create “Who You Really Want to Be.” Thank you very much for your kind attention.